In another topic (holding the Dragon) Bloody-orc warned me that a plastic housing could get Staticly charged just after i built my own. But most modern electronics are encased with plastic, and all the cases i have here (even all plastic PSU units) can be made static. Atmel encases devices in plastics, don't they? Mounting it on a piece of wood or a metal case isn't my style, so what's the sollution? Maby a small piece of an antistatic bag between the pcb and the plastic housing? There was a thread about this appx a month ago in off-topic forum. All I remember is that ABS is non-static. If you are talking about ABS or PVC, you're pretty safe. If you're talking about the type of plastic that celophain (spelling &, I can't remember its chemical name), you run a high risk of damaging your electronic device. Devices enclosed in a plastic enclosure are typically safe. One thing to consider with a fully enclosed device is that, any static charge is built up on the outside of the case - not the inside. The inside of a plastic case remains statically neutral. That is, any charge that might be present on the inside of a plastic case is distributed evenly across the entire inside of the enclosure. Just as all charge external to the case is distributed evenly across the surface of the enclosure. It is the point of discharge where the damage ocurrs. Typically, static electricity likes to discharge at areas that form a point, and not from larger surface areas. The external corners of any enclosures are far more prone to static discharge, then are the external surface areas. The internal surface areas, including the internal (inverse) corners are statically neutral and can't discharge to other areas of the internal enclosure. When the case is open, say, for servicing, standard static practices need to be observed, as would normally be. I use ABS plastic cases for a lot of electronic projects, and have never had any static related failures. In fact, I'm more liable to destroy my project because of my own stupidity, and not static discharge. Read something like that too, someone with a modified cd case. Wasn't able to find the topic using google or the search function. Ah someone who has fought this battle before. My casing that i made before all of this was an old electronics project casing, it's darkened see through plastic. Is See through darkened plastic always Cellophane?, is there any way to check? use the test I described in the other topic. Just rub that and see, if the static builds up or not. if it doesn't you are safe, if it does... you know what to do. After yet again a thorough cleaning of my initial housing i threw it away because it seemed more prown to static buildup than other non see throug plastics. I don't think that the color of the plastic determines the static suseptibility of plastic. After all, the color is only a dye mixed into the raw plastic. The wool-rubbing test is one method to test for the static holding ability of plastic. There are static measuring devices that measure the suseptability of a material to hold a static charge. Using one of these instruments would be the correct way to determine a plastics usefullness for electronics applications. As to how cost effective it would be??? So, rubbing the plastic with wool and seeing if it moves two very small pieces (electrometer) of aluminum or, it it raises the hair (I don't have much hair, you might have to use one of your kids) on your head, would be at least some indication of the presence of static build up. What would be the difference anyway even if you'd have a metal surface, you'd still have the board floating in air? Why didn't atmel include good old HOLES in the board? There are pointy haired bald people. Time flies when you have a bad prescaler selected. What would be the difference anyway even if you'd have a metal surface, you'd still have the board floating in air? Probably none... The advantage to a metal plate, though, would be that you could properly ground it. I'm not sure how that would work with a plastic that inherently builds static charge. Why didn't atmel include good old HOLES in the board? I've asked myself that question, ever since I got my first STK500. And, I asked it again, after getting the Dragon. While I understand that Atmel doesn't want to raise the cost of their development products with fancy cases, it costs incredably little to design suitable mounting holes into their caseless products. Wouldnt a nice metal plate combined with a nice little dragon make a nice little capacitor? 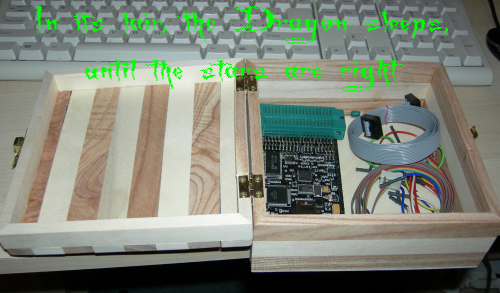 BTW: My temporary solution: When I simply have the dragon in a box, I have it on the original conductive foam. When I want to use it I take it out of the box. Ps Daqq shouldn't you be revising for your exams right now? they are like... TOMORROW! We all have to have our priorities. ;-) Nah, I got 1 from english, and 3 from literature. So i'm happy. The final exam from my specialization will be thursday. bloody-orc: Good luck to you. 1 means best in slovakia, 5 means worst. Wish you good exams too Rain :! : Chemistry ... I remember that being a PITB for Dean too, ... so thumbs up ... soon exams will be over. I hotglued the pcb while sill sitting on its antistatic foam, works like a charm!! I can't remember whose web site gave me this tip but digikey part number SRH65TG-ND is an almost perfect fit for the Dragon. Four screws hold the board down and it would be a simple matter to make holes in the top of the case to allow plugging in the ISP leads; I'm just using half the case with rubber feet on the bottom.